Franco Montalto, Philadelphia and Venice. “Stronger than the storm.” I can’t get this phrase out of my head, nearly one week into my sabbatical move to Venice, Italy. It so happens that we arrived on a week when the moon and the winds lined up to create acqua alta (high water) for six days in a row. On day 1, I thought I could wait it out inside. 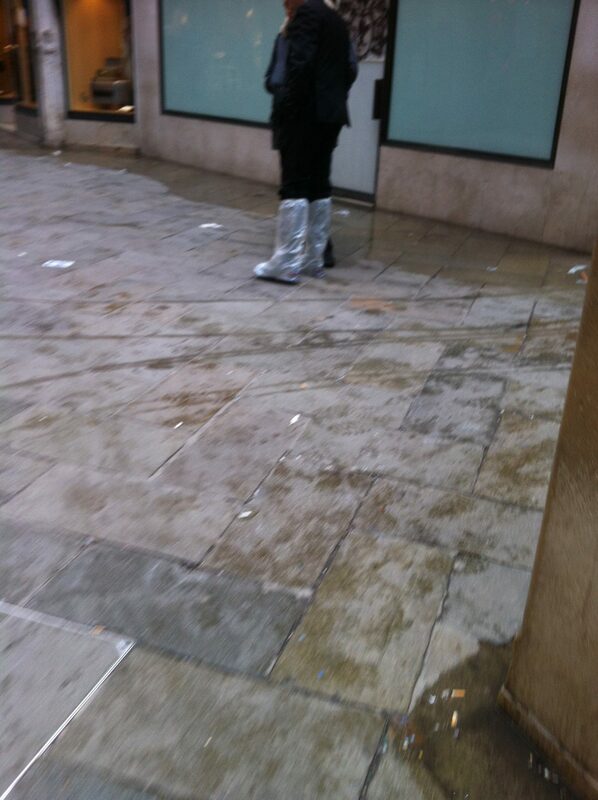 On day 2, I got a little antsy, and bought 7 euro galoshes to pull over my brand new Doc Martins. On day 3, after springing a devastating leak in my right galosh while in shin deep water, I gave up and set out to buy stivali (boots). I was shocked to find a perfect pair for only 12 euros (about 15 dollars) at the hardware store on my corner, and that’s when it hit me: this is resilience, already in action, and right in your face. Thanks to their history, and their coastal position next to a rising sea, Venetians are used to storms, and know how work around them. But are we all destined to need to make these kinds of changes? 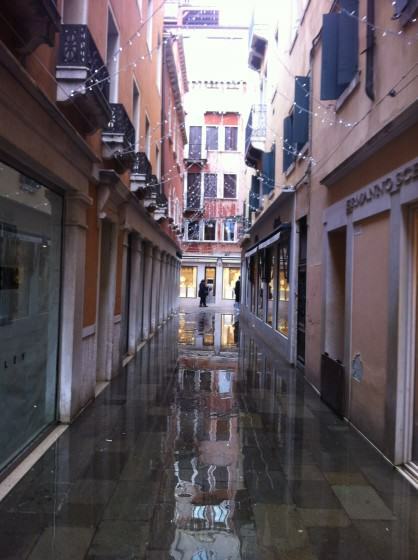 Contemporary Venetian culture is heavily impacted by climate change. Two hours prior to every high water event, sirens followed by a sequence of eerie whistles sound throughout the city. The siren gets your attention, and the subsequent number of whistles tells you what the predicted high tide level will be. Each whistle indicates another 10 cm over 100 cm, the tidal elevation corresponding to 5 percent of the city under water. When you hear three whistles, as we did several times this week, 75 percent of the city is under water. 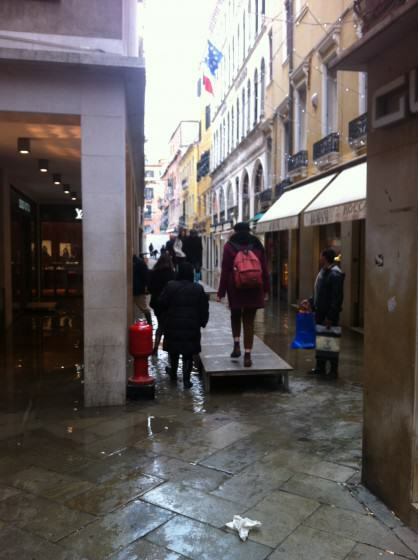 When that happens, the city government deploys kilometers of passarelle (elevated wooden walkways) in the portions of the city with the deepest inundation. Shop owners place small barriers in front of every door, while continuing to hawk their wares. Sump pumps (that you never see) begin discharging water (of different colors) into the alleys through small plastic tubes, which you suddenly realize are all around you. And everyone, including the most dapper among them, sports boots. The young college girls wear black boots; the rugged delivery men where hip waders; the bridges and tunnels crowd, coming into Venice for work, wear garbage bags over their shoes. The Southeast Asian immigrants, who at other times of the year sell pocket lasers and fake Gucci bags, start selling boots and fluorescent galashes to the tourists in Piazza San Marco. But a basic pair of shin-high boots, like mine, gets you just about everywhere. Walking through the flooded streets is another interesting experience. Everyone slows down—tremendously. It wasn’t initially clear to me why this was happening. Without cars, there’s always a lot of ground to cover in this city, and the average Venetian typically moves at a healthy gait. Feeling confident in my new stivali, I continued to move at this pace only to find out within a few minutes that I was suffering death by a thousand drops. It seems that each fast step kicks a few drops into the top of your boot. You don’t feel those individual drops, but keep it up and in a few minutes, your socks are soaked. I slowed down, realizing that alas, pazienza, everyone around me was used to this. When there’s acqua alta, it’s OK to be late, or to change the plan, or to cancel appointments. (Though, ironically, not for first graders. My daughter’s new teacher was careful to tell me that acqua alta is not an excuse to be late for school.) Venetians have adapted to contemporary acqua alta the way they adapted to life in a foggy lagoon over a thousand years ago. Life goes on despite it. This said, the flooding is, of course, unpleasant. Though life continues, acqua alta is the subject of continuous conversation. At the supermarket, the woman in front of me on line at the cashier complains that the water level this morning was higher than was predicted by the sirens. The locals get extremely frustrated with tourists who block their way by stopping to take photos on the narrow passarelle. An elderly couple I encountered couldn’t get to the hospital to talk to their doctor because the vaporetto (boat bus) couldn’t fit under the Ponte dei Tre Archi due to the high water. 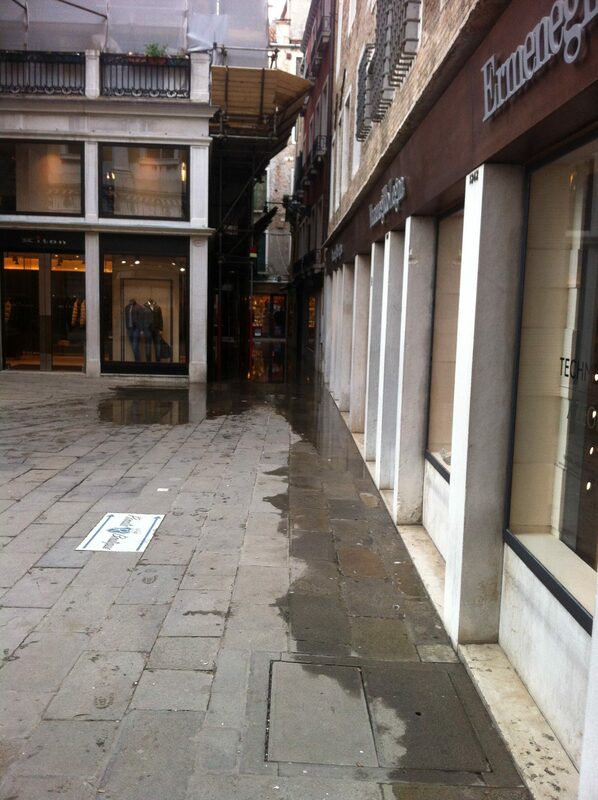 In short, though Venetians have adapted, the situation is not welcome, and creates some very formidable challenges. Here is a city that is “stronger than the storm,” but definitely not voluntarily, and certainly not happily. As I plod through the beautiful yet flooded streets, staring at the water ponded several inches on the marble tiles of cafés with delicious pastries in glass windows mere inches above the floor, I ask myself why our global culture can’t look at this example and make the changes necessary to avoid other coastal cities having to face the same fate. 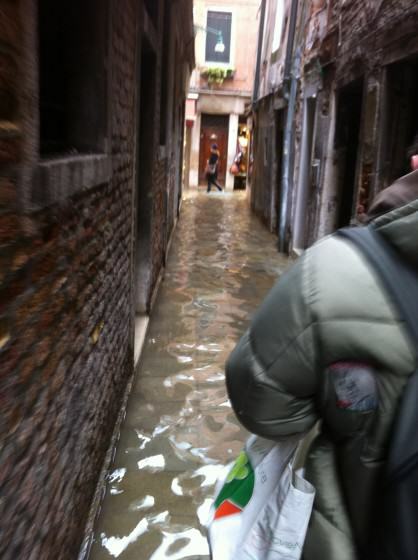 Sure, the vulnerable can try to adapt, and those with access to significant resources may, like the Venetians, achieve some level of resilience. But at what cost, and what fate faces those countries, cities, and peoples who can’t afford to build massive storm surge barriers, deploy kilometers of walkways, enforce new construction standards, or elevate critical infrastructure nodes? Why has the push for mitigation and the global cultural change necessary to significantly reduce emissions fallen so far behind the call for adaptation to an “unavoidable” future? Yes, there is momentum in our emissions, and even if we stopped emitting greenhouse gasses today, a certain amount of change would still occur. And yes, it is politically naïve to think that there is any chance that significant cutbacks in global emissions will occur in a short time frame. 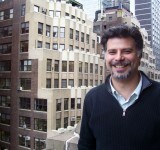 For these reasons, we need to find ways to adapt to changes that are, in most cases, involuntarily imposed on us by an anthropogenically modified climate system (and especially in cities housing particularly vulnerable and economically challenged populations). But when will we pool our global resources and knowledge to develop true comprehensive global solutions to these problems? There are some reasons to be cautiously optimistic. 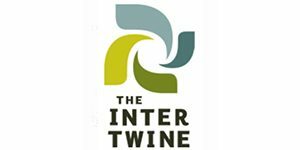 For example, I came across a recent New York Times article titled “Leaders in Davos Urge Quick Action to Alter the Effects of Climate Change,” and found it intriguing that participants of the World Economic Forum, for years the targets of anti-globalization protests for their perceived advocacy of trade liberalization and corporate profit over environmental conservation, worker rights, social justice, and other contemporary sustainability goals, have now “redoubled their calls to combat climate change.” And here in Italy, the Pope is known to be preparing an encyclical on ecology that he will deliver in the months leading up to the December 2015 United Nations conference on climate change in Paris. The expectation is that he will make the case that disagreements regarding the specific causes of climate change do not preclude the need for action. The pontiff is also expected to say that care for all creation, and healthy global ecology are the basis for global development and world peace, as recently reported in the National Catholic Reporter. But while these and other statements from global economic and religious leaders may be encouraging, progress in the US, a country that a recent study by Concordia University suggests is responsible for 20 percent of the global warming observed through 2005, is dismally slow. Democrats seek action but are blocked by a powerful Republican lobby that doesn’t believe in anthropogenic climate change, or isn’t willing to consider legislation designed to reduce emissions significantly. In a hearing last week, Senator Ted Cruz, expressed concern that the recent focus of the National Aeronautics and Space Administration (NASA) on earth science (including climate science) is taking resources away from space exploration, what he considers to be its core mission. In January, the current leading Republican contender, Gov. Scott Walker, threatened to bring a lawsuit against the federal government if it passes legislation limiting carbon emissions from coal-fired power plants. And Florida, home to Jeb Bush, another Republican presidential contender, restricted its Department of Environmental Protection employees from using the terms “climate change” or “global warming” in official correspondence. As the drops seep deeper into my boots, I get frustrated at the pace of our collective inaction on climate change. We can talk about how to live in unpleasant situations, or we can attempt to reduce the likelihood of making our lives unpleasant. Is there not a great deal of hubris in thinking that we mortals can become stronger than nature? As I reach home to my children’s happy voices, I wonder if we will learn that lesson early enough to keep their feet dry. I have a question that is in a similar vein to your response to Marianne. 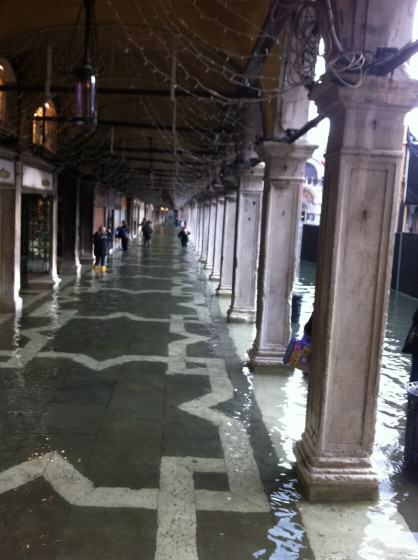 In your opinion, has the exposure to a changing climate made the citizens of Venice more aware of their role as stewards of nature? I have seen this shift to varying degrees with people in Los Angeles dealing with drought, and people from New Orleans post-Katrina. I am curious if increased acqua alta has changed Venetians similarly. Thanks. My favorite city in the world, and I hope it endures for centuries, but, you know, only ten people live on Torcello now, where it all started. Change is inevitable. Maybe those computer simulations are wrong: their performance for the last eighteen years has been rather poor. Meanwhile, adapt we must. Thanks Marianne. Yes, indeed. I work regularly on adaptation strategies including both technical approaches (rainwater harvesting and green infrastructure) and non-structural measures (plans and policies, etc), and certainly many of these can also provide a level of mitigation. 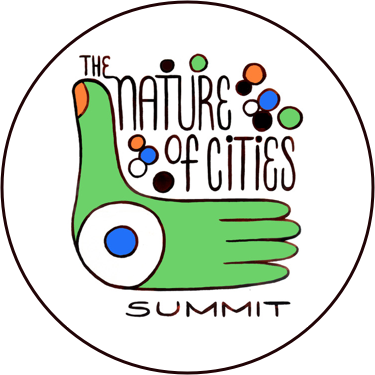 But I’m yearning lately to see the kind of creativity and the level of resources now being invested in green infrastructure to also be invested in reducing emissions associated with everything else we do…. and it would be a shame if the excitement over GI overshadowed that parallel need. But this requires at least regulation of emissions, and potentially also a broadening in our perspective about what we can continue to do safely while we green our cities and landscapes.. Thanks Franco for this interesting perspective from Venice and for raising the mitigation / adaptation issue. This is an issue I think a lot about vis a vis my work in environmental education. Our environmental education tradition has been mitigation (reducing human impacts) but our suggested actions seem small and out of step with the magnitude and immediacy of climate change. On the other hand, is adaptation a relinquishing of our core values? The IPPC report chapter on various types of adaptation–ecosystem-based, community-based, etc–I found helpful in this regard–i.e., adaptation actions that are consistent with reducing our impacts.